Rest and exercise are other great times to recharge the brain and generate good ideas. 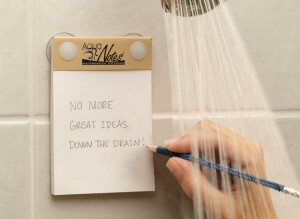 A good friend of mine keeps a notepad by his bed to capture ideas he often wakes up to in the middle of the night. Michael Hyatt and several others have argued the value of taking naps in the middle the day. I haven’t implemented this due to my tendency to take 2-hour naps vs. the recommended 20-30 minutes. With all these great places to think, what should all that desk/cube time be used for? I do my best big-picture thinking when I’m not concentrating on creating or consuming. When I’m showering, walking, sitting around a fire, or somewhere else where my brain isn’t fully engaged, it’s as if it catches up on all the processing that was suppressed while I was busily using it. Desk time is great for doing the work, but away time is better for thinking about the work and bigger things.